Annapurna Complete Trek Throughout the trek you will be amazed by the natural landscapes providing by the Annapurna range. It will take nearly three weeks trek through beautiful valleys, snowy peaks and adventurous. Moreover every stop in villages will be a unique time to share time with local people and understand their own lifestyle in the mountains. After the breakfast, you will be taken on a guided tour to the most spiritual and popular attractions in Kathmandu. Some of these attractions are even included in the list of World Heritage Sites. Witness the brilliant Bhaktapur Durbar Square, the holy Hindu temple of Pashupatinath,the renowned ‘Monkey Temple’ (Swayambhunath), and one of the largest stupas in the world-Bouddhanath. Overnight in Kathmandu. We make our way to Khudi via Besisahar. After about 5-6 hours into the drive we reach the town of Dumre from where we steer right leaving the highway towards Besisahar. A short drive from Besisahar takes us to Khudi, from where our trek starts. We can also start our trek drirectly from Besisaharto Khudi. From Khudi we start seeing nice glimpse of the Manaslu range. Today, we make our way through a few suspension bridges and waterfalls joined withmany ascents and descents across rice paddies and a subtropical forest. The first part of the trail is moderate but slowly the trail becomes steeper. We start to see even better views of the mountains. On the way to Sirung village we pass Taranche, a small Tamang community. 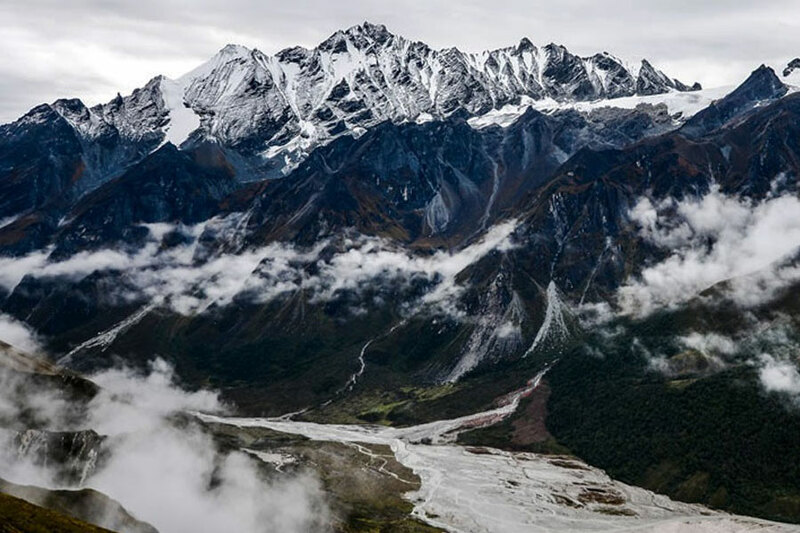 From Sirung we get great views of the NadiChuli and Manaslu mountains. The first part of the trail is relatively moderate. We make our way through the woods, several small villages and a few temples. We also cross a few suspension bridges one atMipra over the SanguKholaand the other atSyange over the Marshyangdi River. From here we walk alongside the great Marshyangdi River and we cross a one last bridge to reach Jagat. This days’ walk is one of the most rewarding as we get tremendous views of the LamjungHimal, Annapurna II, and Annapurna IV (7,525m/24,688ft) and to top it all off we encounter small hot springs too where we canrelax and chill for a bit. We embark on a challenging journey this day. We walk throughsteep narrow paths, a dense forest towards, and steep slope rising 5000 ft. We are welcomed by fantastic views as soon as we make it through the narrow path.When the valley widens we see the PaungdaDanda, a giant of a rock rising 5,000ft (1500m) above the trail. We continue until we reach Lower Pisang. Overnight in Lower Pisang. After a nice breakfast, we start making our way to Manang today. Manang can be reached through two ways. We choose to take the one that takes us to Upper Pisang via Geru since the route is filled with beautiful views of Annapurna and Pisang along with the stunning landscape. Visitors will notice the change in landscape and vegetation this day;the green vegetations give way to desert like arid landscape. At Manang we will visit the largest monastery in Manang -the Barge monastery. Overnight at Manang. As the altitude picks up we must take a day solely just to acclimatize. So, we will spend he day going on a short hike to either BhojoGumba or Gangapurna Lake. 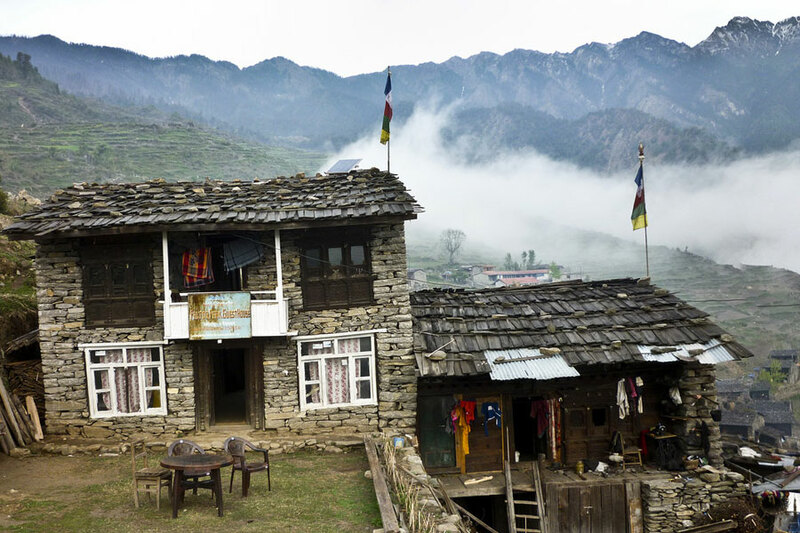 If there is some spare energy left in us we would make a visit to the Himalayan Rescue Association atVraga Village. There we can have more information about Acute Mountain Sickness (AMS). Overnight in Manang. Today’s journey is going to be a short but a fulfilling one. The first part of the trail has us crossing a stream, ascending toTenki and further out of theMarshyangdi Valley into the valley of JarsangKhola. We continuefurther northwards passing near the small village of Ghunsa and then through pastures where horses and yaks graze. At this point we are at the last part of today’s trail. We cross a small wooden bridge; thenpass an ancient old Mani wall in a pleasant meadow to finally reach Yak Kharka. Overnight at Yak Karka. Today’s walk is steep but filled with beautiful views! We climb all the way to ThorangPhedi which is the last village before Thorong La pass.The first part of the journey has us crossing a suspension bridge to reach Ledar village. We climb further passing through high cliffs to reach ThorangPhedi. We get brilliant views of Mt. Khatungkan, Thorung Peak,Mt. Syagang, and Mt. Gundang. Overnight in ThorangPhedi. Today’s challenge is the Thorong La pass- one of the highest passes in the world! It is a challenge, but we don’t want to make it that hard, do we? So, we will take the easy, safe route which is crossing the pass from east to west (Manang to Muktinath). All your hard work will be paid off at the end of the day as the views at the top is breathtaking! After reaching the top we descend towards the Muktinath Valley. Overnight in Muktinath. Today’s journey is going to be a spiritual one! Holy for Buddhists and Hindus, Muktinath is an important pilgrimage site. We visit a temple and a monastery at the first part of our walk for today. Then we make our way to Jomson (Marpha) via Ranipauwa village and Kagbeni.We walk along a plateau above Kali Gandaki River, the world’s deepest gorge for today’s journey! Marphaat Jomson is very famous for apples and a famous local apple brandy also named Marpha.Overnight in Marpha. On today’s journey, we encounter traditional villages of the Thakali people, beautiful apple gardens and panoramic views of Dhaulagari, Tukuche, Nilgiri, Fang and Annapurna I mountains. We take a new route to Kalopani passing viaChokhopani. On reaching Chokopani we move further to Kokhethanti. We move further crossing a river to reach Kalopani. Overnight at Kalopani. Tatopani means hot water which must give you a hint where we are headed to- a hot spring! Today, it’s all downhill! For the first part of the journey we cross a bridge at Ghasa. As we descend further, we find ourselves back todense subtropical forests. We continue until reaching Tatopani where we take a relaxing dip in the hot spring. Overnight in Tatopani. This day we leave behind Kali Gandaki and move towards theGharKhola valley. We walk through terraced farmland and villages of Shikha and Chitre before reaching a beautiful rhododendron forest, all the while surrounded by stunning mountains. After this we walk a short distance to reach our destination-Ghorepani, a beautiful village at the top of a ridge. Overnight in Ghorepani. This day, we start early to witness one of the most satisfying and breathtaking scene one can dream of-the sunrising in the Himalayas. 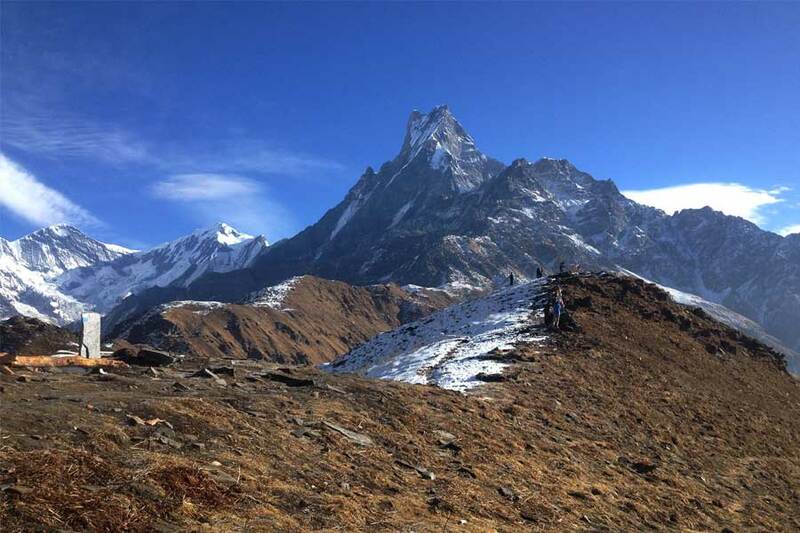 For this, we start early on a steep trail towards the viewpoint at Poonhill(3,210m/10,529ft), which is of the most popular trekking destinations in Nepal and the Annapruna region. From Poonhill, we also get mesmerizing views of the Annapurna and Dhaulagiri ranges, Mustang, Pokhara and more than 20 of the highest mountains in the world. After feeding ourselves with awesome views, we then return to Gorepani to feed ourselves actual food. After breakfast, we make our way towards Tadapani. We first ascend and then descend through rhododendron forests, we thenpass by some beautiful waterfalls to finally make ittoTadapani. Overnight in Tadapani. It’s going to be a beautiful journey today. On our very first part of the trail, we find ourselves climbing down through a dense and dark forest of old rhododendron trees.As we continue our journey,and if it is the right time of the year, we will get to see cherry blossoms in bloom on the slopes on the other side of the gully. Soon, we shall reachGhandruk, a beautiful Gurung village withintimate views of Annapurna South, the Fishtail mountain, and Hiunchuli mountains. From here, we trek further towards Nayapul. We stop walking from here and start riding. This signifies the end of our trekking journey in the Annapurna region. We drive to Pokhara and stay overnight. After a night of celebration, we prepare to leave for Kathmandu for some packing and more celebrations. We say goodbye to Pokhara and get on a 6-7 hours’ drive to Kathmandu. On reaching Kathmandu you will have some spare time to do some last-minute souvenir shopping and resting. A dinner party is arranged to celebrate your successful journey. Overnight in Kathmandu.